HT-A2 thermal sensitivity is special for Mobile Phone repair. HT-A1 thermal camera is an infrared camera that integrates surface temperature measurement and real-time thermal image. 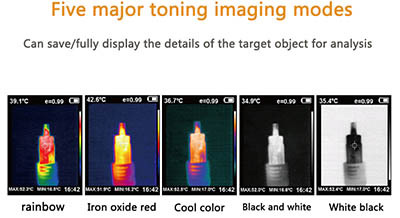 resolution infrared camera with high quality. 1. Don't use the device in explosive, flammable or corrosive environment. 2. The product belongs to precision electronic and sensitive optical devices. Don't impact and drop it to avoid damage. 3. Don't dismantle and remodel the products. 5. Please use damp cloth or weak soap to clean the enclosure of the device.Don't use abradant, isopropanol or solvent to clean. Special optical lens cleaner is used to clean the screen.